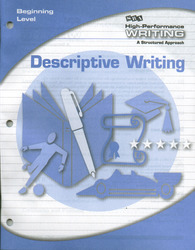 Using the direct-instruction method, High-Performance Writing addresses the writing instruction needs of all students including special education and ESL students. Each unit follows a sequence of instruction and contains a complete sequence of activities to achieve a particular piece of writing. Terry Dodds, author of several other SRA direct-instruction programs including Readers and Writers, Learning Through Literature, and Language for Learning, developed the program. Units built around specific topics address the writing genre frequently identified in state frameworks, allowing you to target grade-appropriate writing skills. Straightforward lessons provide the scaffolding students need to internalize the writing process and emerge as independent writers. Writing and revising strategies help students incorporate the six traits of effective writing. Terry Dodds is an educational consultant and program author, specializing in language arts with a focus on literature-based instruction, the writing process and reading. A frequent presenter at Association for Direct Instruction conferences, she has more than 30 years of experience as teacher working with regular and special education students and as a teaching principal. Currently a trainer for Educational Resources Inc., she works closely with districts that have a high percentage of minority and disadvantaged students to implement school-wide improvement.